STEAM Stories is a series of interactive picture books, each introducing a different STEAM topic: Science, Technology, Engineering, Art and Maths. Max and Suzy discover an old robot and set out to try and bring it back to life. Can they use their technological know-how to put it back together again? 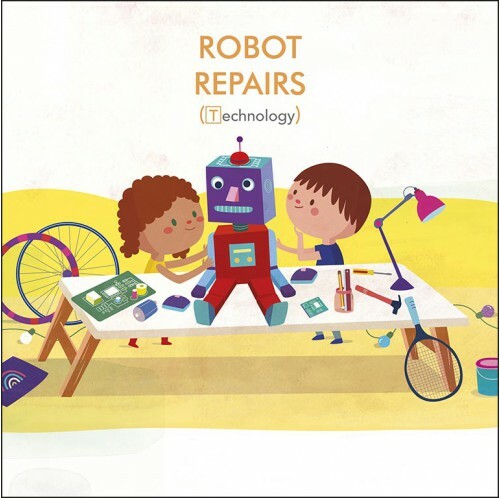 Help them work out how to fix sections together, insert batteries and make the robot break out some dance moves in this fun, interactive engineering story. STEAM Stories is a series of interactive picture books, each introducing a different STEAM topic: Science, Technology, Engineering, Art and Maths. Join dynamic duo Max and Suzy in these action-packed problem-solving adventures which introduce children to key STEAM concepts through a gripping, interactive story.